The 7th Annual Maine Deaf Film Festival will be held in Portland this Saturday. Hosted by the University of Southern Maine Sign Language Club, all the films shown during the event are created, directed and produced by deaf or hard of hearing individuals. It starts at 1pm. The Midwest Ear Institute holds its annual benefit golf tournament on Wednesday, June 17 at Deer Greek Golf Club in Kansas City. The cost is $200 per golfer and $1,000 per hole/team sponsor. The funds raised will go toward providing cochlear implants. The Institute is not-for-profit cochlear implant center founded in 1980. The Alabama School for the Deaf honored State Senator Jim Preuitt yesterday at the dedication of a new multi-million dollar building being named in his honor. The Alabama Institute for Deaf and Blind keep him from knowing his name would go on the building until the ceremony itself. Students began moving into the new dormitory for middle school girls last week. It’s the first newly constructed dormitory building on the on the campus in nearly 50 years. Preuitt was selected because of his efforts on behalf of the institution for many years. The six remaining teams on the CBS show Amazing Race had to pull their partners through the streets of Phuket, Thailand on a rickshaw. The task was difficult enough for Marge and Luke. Because he's deaf, the 50-something mom had to do the pulling for the entire two miles. To make things worse, another team (hollywood stuntmen Mike and Mark) decided to pull a prank on the other teams and hid a tire pump. Several teams were forced to pull the rickshaw on flat tires. Margie was one of them and as soon as they celebrate their fourth place finish, Margie asks for some water, then she collapsed from dehydration. She recovers after getting some water. WHP-TV reports on the planned closing of the Scranton School for the Deaf because state budget cuts. Mac Funamizu has come up with a small, locket-sized device that goes around a person’s neck. The Sign Language Interpreter is designed to read hand gestures and then speak the signed words out loud. A camera picks up gestures and the wearer controls the volume. What is unclear is how it does anything more than offer simple one-to-one word translation. That works with Signed English (which is not its own language) but with a full-fledged real language like ASL. American Sign Language has its own unique grammar structure and combines facial expressions with body movement, making it very difficult for these types of devices to translate it into spoken English. The Northeast regional competition in the 2009 Gallaudet University Academic Bowl starts today at Mill Neck Manor School for the Deaf in New York. Maple Woods Community College in Kansas City is planning to cut its sign language program. The school claims half the students are dropping out before graduation. And those that complete it are having trouble finding work. The only other ASL program in the city is at Johnson County Community College. Administrators will make a final decision as to whether to axe the program tomorrow. Explores the contributions of deaf baseball player Dummy Hoy and legendary umpire Bill Klem. A film from the Netherlands, it profiles Anna van Dam, one of the few Jewish deaf people who survived the Holocaust. This film is about a Bedouin village that is believed to have one of the highest percentages of deaf populations in the world. This one is ab out four deaf entertainers. Luke came into the competition having long ago mastered one of the game's essential skills: communication. On last night’s edition of The Amazing Race, the teams found themselves in the slums of India. Deaf contestant Luke cried when we say a child eating from a pile of garbage. Luke and his mom, Margie, had to put on a costume and dance for money. They finished the episode in 4th place. Two former fight attendants arrived last and were eliminated. The teams next head to Thailand. The CBS promo for the episode shows Margie overcome with heat. A wine Tasting event in New Bern, North Carolina this Saturday will benefit 20 deaf students who need special equipment that the schools they attend cannot provide. The effort is being lead by the vice president of the New Bern Breakfast Rotary Club Dr. Tom Joseph who is an audiologist. The March 28th event will take place at the New Bern Sheraton and feature some 70 wines. More information. Michigan lawmakers have passed a resolution declaring September 20-28 Deaf Awareness Week in the state. Public schools and communities will be asked to find ways to promote Deaf issues. The effort was lead by a deaf student at Lake Orion High School. A sign language interpreter in Brownsville, Texas could spend the rest of his life behind bars. Ricardo Vargas was convicted of sexually assaulting a 14-year-old at him home in 2007. Vargas is expected to be sentenced April 7. Sioux Falls school was nearly shut down when South Dakota's governor proposed cutting its entire budget. That would have meant mainstreaming all the students. But that plan was defeated and lawmakers restored the money for the school. Parents are unlikely to see their change come through because it would require an amendment to the state constitution. 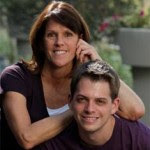 One of the contestants on the Amazing Race said he hadn't given much thought to the Mother and Son team make of Margie and her deaf son Luke. But, he told the audience, "Now I realize they're the power players here." True to form, they were the first team to arrive at the episode's final destination, winning themselves a trip to Saint Lucia as their prize. Luke said, "First place two times. We're doing a lot better than we thought we would. We're very confident that we can win the Race." Besides driving a snow plow in Siberia, Luke had to strip down to his underwear before going for a 1.4 mile run with two local runners. It happened again. This time in Elk Grove, California. Someone used the California Relay Service to phone in a phony crime to police. A SWAT team, hostage negotiators and even a helicopter were sent to a house where a caller had reported a man shot and killed his son. But it was a hoax. Unfortunately, Police have no way of knowing if the call is authentic or not, so they have to respond. Advocates are concerned these kinds of false reports will make law enforcement more likely to be suspicious and less trusting of the deaf and heard-of-hearing who call in a real crime. And that's not including the cost to the community. Deaf by Quota International of Canton, Ohio is recognizing Emmett Boyd as its Community Champion for the Deaf. Ohio’s Stark County is also recognizing Boyd after 34 years of loyal service to the county. He has been deaf since birth and has worn a hearing aid since the first grade. He also serves as president of the Canton chapter of the Hearing Loss Association of America. The Washington State Center for Childhood Deafness and Hearing Loss could soon be the new name of the Washington School for the Deaf. Some state lawmakers have pushed for closing both the School for the Deaf and the Washington State School for the Blind. But the state House unanimously passed a bill this week that would make the deaf school’s Vancouver campus the headquarters for deaf services for all 39 counties in the state. The residential facility connected with the school would continue without change. Current superintendent Rick Hauan would become the School for the director. If the plan goes forward, the state will eventually have two districts in which deaf and hard-of-hearing students are served: One in Vancouver and one in Eastern Washington. Right now, there are services offered in Spokane, Pullman, Wenatchee and Seattle. Vancouver has an enrollment of more than 100 and nearly 170 are helped around the state through video. But there’s many more who are not reached this way. A study just a couple of years ago showed more than 80% of Washington’s 472 deaf students and 98% of 933 hard-of-hearing students were attending local schools. On this day, 21 years ago the Deaf President Now movement succeeds. I King Jordan became the first deaf president of Gallaudet University. Also, Deaf History Month begins today and runs through April 15. The family of Joan LeVasseur plans to remove her from life support. The 26-year-old deaf woman was hit by a car in Minneapolis this past Friday. The driver speed away from the scene without stopping. LeVasseur suffered a severe brain injury, multiple leg fractures and other injuries. Police in the Apple Valley area are looking for the person who caused the accident. 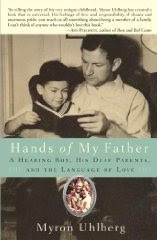 This NPR link takes you to a half-hour interview with Myron Uhlberg who has written a new book called Hands of My Father. It's about his experiences as a CODA. He says one foot was "always being dragged back to the deaf world," the other "trying to stride forward... into the world destined to be own." The Mid-Atlantic Region competition in the 2009 Gallaudet University Academic Bowl starts today at the the Model Secondary School for the Deaf in Washington, DC. The Northeast regional takes place March 26th at Mill Neck Manor School for the Deaf in New York. Stephen Dubner, writing on the New York Times website, decries the consequences of ADA law when it comes to doctors and their deaf patients. The example he cites as outragious is the LA doctor who had to hire a sign language interpreter for a deaf patient. Dubner says only $58 of the $120 an hour fee (with a two-hour minimum) was reinbursed by the woman’s insurance company. That left the doctor paying more to see the patient than he was getting back for his services. Dubner considers this outrageous and wrong. He argues that the patient ends up the loser - suggesting that she will get poor care because the doctor is likely to give the patient the runaround and pass over her. He goes on to tell readers that was wrong for a woman to take a New Jersey doctor to court for failing to provide an interpreter. The doctor was made to pay $400,000. Dubner considers this was a frivolous lawsuit. What he leaves out of his article is the fact that the patient in this lawsuit (Irma Gerena) made repeated requests to rheumatologist Robert Fogari for an interpreter while he was treating her for lupus. The doctor refused to even meet with an interpreter so that he could have ADA law explained to him. Gerena eventually switched to another doctor who immediately changed her treatmen. There were side effects to Forgari’s regiment that were unclear because of the communication problems. Dubner fails to address the communication problems that take place when writing notes in English is used with deaf patients and what can happen when family members serve as interpreters for deaf patients instead of doctors providing professional assistance. He also doesn't explain why those who speak other languages (like French or Spanish) should be afforded the opportunity for interpreters but not those who are deaf. Adam Bondurant works for the North Santa Rosa County fire department in the Florida panhandle. Born deaf, Adam battled a rare medical condition that sent him to the hospital many times as a child. But when he was still young, he told his grandfather he’d become a firefighter when he grew up. And Adam has done just that. He received a cochlear implant at the age of eleven and never looked back. The day Stephen Pyles woke up to find his home in the Baltimore suburbs ransacked and money and credit cards missing was also the day he was arrested for trying to explain to an police his frustration at the constant burglaries. Officer Louis Facciponti claims the 56-year-old deaf man punched him “suddenly and without warning”. But a paramedic who saw the whole thing says Pyles was only trying to get the officer's attention by putting a note to the officer’s chest that explained his frustration at feeling that his home was unsafe. He was upset that police had done nothing to stop people from repeatedly breaking into his home while he and his family sleep. Pyles was wrestled to the ground and Facciponti refused family requests handcuff him in front so he could sign or write notes. Pyles wound up in the hospital after the confrontation because he had just undergone neck surgery and was reinjured during the scuffle. But the officer refused to let paramedics check put Pyles before hauling him off in the police car. Pyles was charged with second-degree assault and resisting arrest. But prosecutors now say they are dropping all the charges because the only non family witness confirmed the deaf man’s story and not the officer’s version of what happened. There’s a new group in Australia bringing together poker and deaf people who like to play it. In association with Australian Poker League, Sokong Kim has founded Deaf Poker Australia. He's planning the first annual Australian Deaf Poker Championship in August. If enough money can be raised, the event a free event for interested players. All revenue raised will go directly into the prize pool after costs. There is already a US National Deaf Poker Tour. The American group has an event planned for this weekend in Atlantic City at the Trump Taj Mahal. The only significant difference between regular poker and deaf poker that the players have to provide documentation proving their hearing loss and the official language is the “official" language at the table. An interview with actress Marlee Matlin by Connecticut's WTNH-TV. Aerobics classes may help you lose weight but it also may lead to hearing loss. A Canterbury University researcher says he measured the hearing of participants before and after their classes and found the effects of the loud music could lead to permanent hearing loss. Details are in the Oticon Foundation's newsletter Soundscape. A deaf woman in Minneapolis is in a coma after being hit by a car who's driver left the scene of the accident. KMSP-TV has the story. Tonight's CBS show Amazing Race took the contestants to the cold of Siberia. Each team had to stack a large pile of wood. Many teams have their wood stacks fall over before they are able to complete them. But not deaf contestant Luke and his mother. Luke and Margie actually complete their woodpile and decide to block the progress of Amanda and Kris by putting a U-turn in their path. That forces the dating couple to complete an extra task. The couple ends up getting eliminated as a result of falling so far behind the others. In the next leg of the race, one team member must ride a bobsled down the hill in less than 4 minutes while keeping track of certain letters along the way. The letters are then used to make the name of a famous Russian playwright. Luke had a hard time putting the name together. His mom felt his frustration but wasn't able to help him. Eventually, Luke unscrambles the correct word “Chekhov”. Luke and Margie complete the episode in 4th place. If you are trying to do your taxes and need a little communication help, there’s a new service to give you support. It’s called C.A.S.H. which stands for Creating Assets, Savings & Hope. Both the IRS and the National Disability Institute support the program. It’s available in nine locations located in five states. If all goes well, the effort will expand across the country. Here's a video about the program in New York. The Arizona School for the Deaf and Blind in Tucson suffered serious fire damage Friday. Investigators blame the two alarm blaze on an unattended barbecue. The damage to a dormatory is estimated at $200,000. Most of the students had left for the weekend and no one was injured. Brent Redpath is realizing his dream to fly at the age of 20. Redpath hopes to soon become one of the nearly 200 deaf pilots around the country. He’s taking lessons at Oregon’s Independence State Airport. He uses a dry–erase board to communicate with his instructor before taking off and a clipboard is used during the flight along with hand signals. The County Commission in Hancock, Ohio presented a six-year-old boy with a plaque and gifts for saving his mom’s life. Brennon Wright is deaf so he couldn’t hear the dispatcher when he called 911. His mother had fallen down the stairs unconscious. Brennon just kept saying, "My momma can't breathe!" When emergency workers arrived, they found Brennon cradling his mother’s head. The student newspaper at San Antonio College files this article about the interpreting program at the Texas college. Small budget cut could impact deaf-blind community. KING-TV in Seattle has more. Medicare officials are investigating a Los Angeles psychiatric for – among other things – holding a deaf man without an interpreter for more than 80 days. Aurora Las Encinas Hospital had inexplicably cancelled a request for a sign language interpreter for the man and left him in isolation. The patient was not aware of his diagnosis or whey he was left there. A New Jersey girls basketball team has a standout player who’s deaf. Leslye Kang is also a member of the Mountain Lakes High School field hockey team. Her basketball coach considers the 16-year-old one of the best one-on-one defender on his team. And Kang scored the decisive goal in overtime to give her hockey team a victory in a first-round game. Tactile aids have been around for decades, but MIT's Sensory Communication Group is looking to improve them by creating software that will offer cues to lip-readers. These tactile devices are designed to work with smart phones by translating sound waves into vibrations that can be felt by the skin. Users are able to distinguish between patterns associated with different sound frequencies like the nuances between saying “p” and “b”. The idea for this project came from a communication method used with deaf-blind people where hands are held to the person’s face while they are talking. That allows the deaf-blind person to feel the vibrations on the face and neck. The National Institute on Deafness and Other Communication Disorders is funding the MIT research. A south Mississippi County’s Board of Supervisors heard a plea for them to install TDDs in Pike County buildings including the county courthouse and sheriff’s department. A coach at the Louisiana School for the Deaf and the daughter of a pastor signed to the members that the equipment is needed. “I’ve been living here since 1985, and there’s nothing been done in this county,” she said tearfully, according to the Enterprise-Journal. Her father, McComb pastor Jerry Gressett was even more direct. He has been asking the board to take action for several years but the county does nothing for its deaf residents. “I’m fed up with this county. I’m disgusted. As long as I can breathe I’m going to fight, and I’m not going to stop.” The board did not provide an interpreter for the coach or Gressett’s daughter. Episode three of the CBS show Amazing Race took teams to Dracula’s homeland. One team member from each group was required to perform a series of moves at the gym where Olympian Nadia Comaneci once trained. Deaf contestant Luke Adams refused to wear the leotard, so his mom had to accomplish the task. Margie and Luke went on to quickly deliver a coffin(!) and figure out the secret to some locks. They finished in fourth place for the night. They’ve also become good friends with former cheerleaders Cara and Jaime. "Gallaudet has opened a lot of doors for me and I realize that I really can do anything, and I get to do things I probably never would have done if I went to another university." Read more. The puppy of an 11-year-old deaf girl had its front legs broken by a man in Oakland right in front of her. The man is Kem Eap and he’s been charged by Alameda County prosecutors with animal abuse. Police got an anonymous tip about what happened. They found the 4-month-old Pomeranian puppy named Chloe hiding under a TV in an apartment. Eap, who is deaf himself, reportedly broke one of the dog’s legs above the elbows and broke the other one the next day. Eap says he’s innocent and the dog injured itself weeks ago by jumping off a bed. The girl says she doesn’t understand why he injured the dog that she recieved as a Christmas present. The Friends of the Oakland Animal Shelter is accepting donations to help the animal. More than 150 people showed up for a rally at Pennsylvania’s Scranton State School for the Deaf this weekend. They are trying to rally community support to keep the school open. Governor Ed Rendell plans to cut funding for their school in the state’s next budget. About two dozen spoke to the crowd, including the city’s mayor and members of the city council in hopes that state legislators will hear their cry. The 129-year-old school was supposed to get more than $7 million for the next school year. It’s the only state-funded school of its kind in Pennsylvania. a new study by NYU's Langone Medical Center. The study’s author says elderly patients are often mistakenly considered too fragile for the procedure because of concerns over how well older people will react to general anesthesia. But the study finds they tolerate it well while undergoing cochlear implant surgery. Details are in the February issue of the journal The Laryngoscope. Uhlberg has written several children's books including Dad, Jackie, and Me, which won a 2006 Patterson Prize. Here’s more about the book.